Penblaith Barn is a converted barn sleeping up to 18 (including two children on a sofa bed) in eight luxury en suite bedrooms. 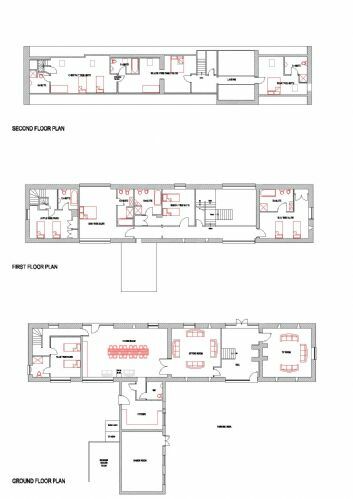 Living areas plus one downstairs bedroom are found on the ground floor to accommodate those less able. Extensive enclosed garden with games room and outdoor hot tub. 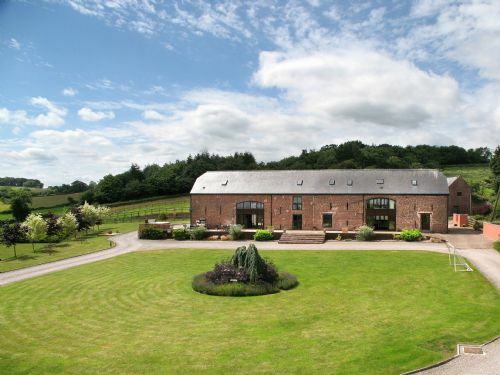 10 minutes drive to Monmouth, 20 minutes from the M50 and Ross on Wye, 30 minutes from Hereford. Beautiful house in a fabulous location with everything you need for a great stay. We have come back to Penblaith again as it is a beautiful house in a great location.The house has everything you need for a happy and enjoyable stay ....just perfect. Thank you, Michelle! Glad to have you to stay again. Best wishes to you all. We were looking for a place with space and an en-suite in every room for my sisters hen do. Penblaith Barn is beautiful, I don’t think the pictures do it justice and the view from upstairs is absolutely stunning. I want to bring my family back now because it would be perfect for a large family gathering. Do not hesitate to book, you won’t be disappointed. Excellent all round, would highly recommend! Fantastic accommodation for a large group. We went for my wife’s 30th birthday - children included. Lots of space and fun things to do. Plenty of living space, bedroom space and lovely views/surroundings. Very clean and very well presented. Will definitely return. Have already recommended to family looking for similar. We hired Penblaith Barn to celebrate my 50th birthday with a group of 16 friends. The communication from start to finish was excellent. The Barn was finished to a high standard throughout , very clean on arrival and equipped to a really high standard with lots of plates/ cutlery / mugs etc to more than accommodate us. The house was cosy and welcoming with lots of different areas for a large group to be able to split and not feel too confined if someone needed their own space. Thank you to Liz and Amy for all they did to accommodate us. We are so pleased you had a super 50th celebration at Penblaith! Thank you for reviewing your stay. All the best. This was our third time at Penblaith. The combination of light and space makes it a unique venue for family get-togethers. Importantly for mixed age groups the two sitting rooms can provide a quiet space when a party continues in the other. Similarly the hot tub and games room are other pleasant distractions. This was our fifth consecutive stay at Penblaith Barn, for our annual pre-Christmas family gathering. There were 18 people of all ages ranging from 5 years to 71 years, and all of us thoroughly enjoyed our stay. The games room and hot tub are always a great hit, together with lots of safe outdoor and indoor space for games. The kitchen facilities are excellent for large-scale catering. We also enjoyed a family-friendly 3 hour walk along the River Mon, from Skenfrith Castle. Thank you for taking the time to write a review. We so glad you enjoyed your fifth visit and look forward to hopefully welcoming you again next year. I'm really pleased you enjoyed celebrating your birthday at Penblaith. Thank you for taking the time to write a review. It was a pleasure meeting you. Amazing property could not have asked for a better property, and Liz was friendly and very helpful throughout the booking and the stay, our party of 16 also thought it was amazing. We will definitely be staying again! Thank you for your compliments. We would be happy to see you again, you may like to try Trevase Granary which has a very different feel to Penblaith but is the same standard and has the same facilities. All the best. Beautiful barn with lots of space for the numbers it caters for. Very rural location so need to drive to any tourist spots, walks or hostelries. Well equipped with 3 dishwashers and the crockery and glasswear to fill them! Beds were comfortable and rooms were spacious. Some low beams on the second floor but these didn't cause any problems or cracked skulls. Hot tub was spacious and clean. Plenty of parking and lovely views. Thank you for your compliments, we are very pleased you all enjoyed your time at Penblaith. All the best. The barn is HUGE. Everyone in the family was really happy with the size and space. Plenty of room for the kids to run around and wear themselves out. The standard of accommodation is superb and the location is just stunning. Perfect for a large get together. Thank you! I'm glad everyone enjoyed the space, which is something Penblaith is not short on! Best wishes. Great customer service from start to finish. Two beds weren’t made up when we got there, but this was quickly sorted. Brilliant range of cups, saucers, cooking utensils etc. Location is good with magnificent views; only stay here is if you want complete isolation (which is what we wanted) as no shops, pubs within walking distance. A lovely house and we’ve had two lovely stays here. Thank you, rural Herefordshire does make you feel as if you can get away from it all yet it doesn't take long to take advantage of the fantastic pubs and attractions, which I'm sure you have found, in the area. Llangrove has a very good pub and although it takes about 45 mins, is a nice walk with lovely views to enjoy on the way. Apologies for the day beds not being made up, an oversight on our part. We are glad you enjoyed to time here again. All the best to you all. All the family were impressed with the facilities. Most amusing event :- 6 grandchildren in super hot tub with music from the film "Jaws" being played by hot tub music facility. It sounds like you all had great fun! Glad you enjoyed the hot tub with the built in audio system. Thank you for your review and best wishes to you all. Penblaith provided everything we needed. It was the perfect location for friends and family to get ready for our wedding. Many congratulations again! We are really pleased your guests enjoyed staying at Penblaith. Thank you for your review. Best wishes from us all. Superb house in a beautiful location. High quality throughout. Very well equipped. A great place for a family get together. Priced at the very top end for August. Only downside was the high number of flies in the kitchen and some in the dining room despite obvious attempts to deal with the problem. Follow owners directions to find house easily. Sat Nav takes you close then leaves you wondering. Thank you for your review and compliments about the property. We are sorry that you found the amount of flies a discomfort, as you mentioned, we had tried to reduce the number. This year in the UK for rural areas there is no denying that there have been significantly more than in previous years so it has not been a big problem before, thankfully. I think we would all agree that this year has had exceptional weather which unfortunately favoured flies! We are just very pleased that horseflies haven't made an appearance. Best wishes to you all. Perfect for a long weekend away celebrating my mum's 80th birthday with family. Very spacious living areas and perfect outdoor dining facilities. The weather was so perfect that we spent most of our time outside and the hot tub was very popular with everyone. Bedrooms were excellent and it was great that each one had it's own ensuite. Kitchen facilities were also excellent with plenty of glasses, crockery etc. 3 dishwashers helped!!!! Everyone had a fabulous time and I would highly recommend the property for family get togethers. The accommodation was very good with large bedrooms and comfortable beds. We did struggle with the heat in the bedrooms so more fans would have been useful. The lounges were both a good size allowing us all to sit together and the dining tables inside and out provided ample seating. The barbecue was large enough to cook sufficient for all while the views from the terrace (and the hot tub) were superb. A very comfortable and enjoyable stay with the only issue being the number of flies - due to the heat and the nearby animal shed. Thank you for your review. We are pleased you all felt well accommodated and enjoyed the lovely Herefordshire countryside views. The flies issue we have taken on board and are investing in more measures to help solve the problem in addition to the fly screens in the kitchen area and other controls we already have in place. 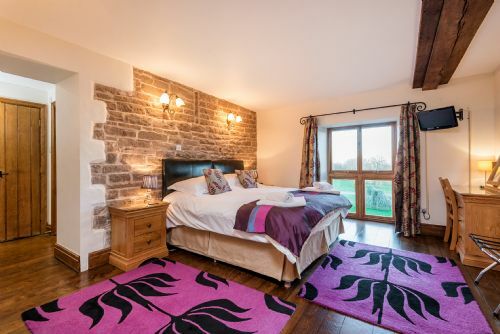 We will look into investing in more fans for those rooms on the lower levels that haven't needed them in the past but the usually cool stone walls have really been warmed by all of this hot weather we have had! With best wishes to you and your family. A Very Happy Family Stay. Penblaith was an excellent, quality venue for our family get together. 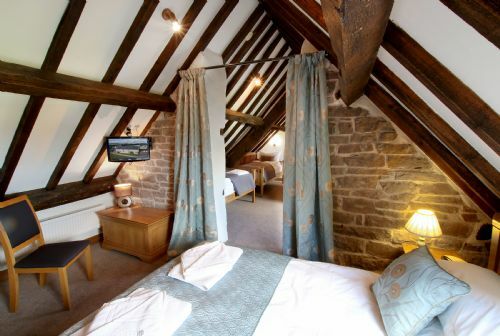 Everyone had a comfortable, attractive, en suite room, the barn provided plenty of space for multiple uses. The Games room was a bonus in wet weather, the outside space generous. A truly lovely, relaxing place to be. The views were phenomenal! Thank you for your feedback. We are pleased you all enjoyed the space and the views. All the best. 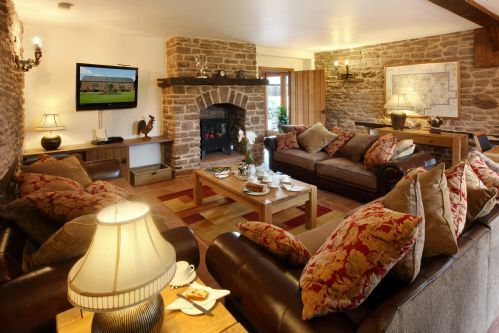 Penblaith Barn is a fantastic property in a quiet, rural location, perfect for a weekend away with friends and family. The bedrooms are all really well furnished and decorated. There is plenty of indoor and outdoor seating - with the patio areas and grass areas ideal for lazy afternoons. For those looking for slightly more activity, the games room was well equipped and well used. We arranged for caterers to prepare a meal for us on one night, which worked really well. There were 17 of us in the house and everyone of those was hugely impressed by the house, the facilities and location. We would not hesitate to book Penblaith Barn again. We really appreciate your review. We are very pleased you would like to return, Herefordshire has so many hidden gems for you to explore! This was our 9th Visit to Penblaith and plan to return in 2019. Thank you, Jim. It is always a pleasure to have you all to stay. We look forward to seeing you next year! Delightful barn conversion with magnificent view. The barn was well designed and well equipped with quality furniture and fittings. The games room and hot tub were great additions. It's always good to sit back and appreciate the views and the space, i'm glad you could too. Thank you for your feedback. Ample parking for cars at the rear gave access to the main entrance. On our left we could see the fully equipped games room. The wow feeling continued as we inspected the house. Ample seating and three large rooms where people could escape to when they needed to escape from other family members. Whether you want to sit on the full length patio taking in the lovely views across to the Malvern Hills or take advantage of its central location to visit the nearby towns and villages, Penblaith is the place to visit. Thank you! We're so pleased you enjoyed the property and managed to explore the area too. Hopefully you sampled some of the fantastic local foods and drinks too! Best wishes. Enjoyable stay in comfortable large barn conversion for party of 14 (65-75 yr old) friends! A large barn conversion with plenty of sitting and eating space, and very good en suite bedrooms. Very pleasant location with far reaching views. Generally well equipped for self-catering with plenty of fridge and freezer space and multiple dishwashers. Links to good local caterers to give everyone a break! Helpful and friendly owners. Took on board some minor problems promptly and efficiently. An unheralded area full of interest for visitors with diverse interests. Would recommend to friends, and hope to return! Thank you for your review. You are quite right, there is such a lot to do nearby. I'm sure you will easily be able plan a full itinerary for your return! All the best. Great family weekend for golden wedding.Max Waldron catering excellent . Helped by the amazing weather we had a wonderful weekend we made full use of the great BBQ and hot tub. We were a party of 15 aged 8 to 83 and everyone had a wonderful time. Very well-equipped property able to provide an enjoyable stay for all ages. Very comfortable and spacious. We visited Penblaith Barn for our 19th annual family weekend and it met the needs of our group ranging from 6 months to 84 years. A large, very well equipped, comfortable property in a lovely setting and with good facilities. Very helpful service before and after from Amy and Liz together with excellent directions. Thank you, Gwenda. We're so pleased you all enjoyed your time together at Penblaith. All the best. What a wonderful barn, great for our stay. Stayed at the barn with friends, family & children & the barn suited everyone perfectly. Penblaith has everything you need & there are plenty of things to do nearby, but you need a car if you want to go out and about. The owners were so helpful & friendly, and would definitely stay her again. Thank you, Rebecca. We're pleased it suited you all. Best wishes. A fantastic weekend had by all. The barn is in excellent condition and is perfect for a get together with friends and family. We went for a girls weekend for a 30th birthday. The location is great, you don't really need to leave the barn! A few went for country walks and popped into Monmouth which is a couple of miles down the road. 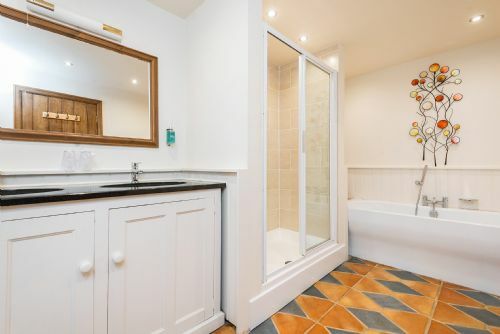 All the bedrooms have en-suites. My family have used the barn several times now and the standard has not changed. I would highly recommend. Thank you for reviewing your stay. It has been a pleasure to have you all and we look forward to seeing you again in the future. Superbly laid out accommodation with everything we needed.location was perfect and we created very special memories that will last forever. Thank you for your review. We are really pleased you enjoyed your time together at Penblaith. All the best. We all thoroughly enjoyed our stay at Penblaith Barn. It was perfect for our family group of varying ages ( 12 - 85). Everyone enjoyed the table tennis and hot tub as well as the very comfortable accommodation and it was a delight to have ensuite bedrooms. Perfectly located and easy to find - we also enjoyed a couple of long country walks . I would recommend this accommodation highly. Thank you! I'm glad you enjoyed all of the facilities at Penblaith and explored the area too. Wishing you all the best for 2018. Following our previous week's stay for Christmas 2014, our family returned to Penblaith Barn (2017). We had a wonderful time celebrating our eldest daughter's 40th on the 23rd, and Christmas, with our 5 children, their spouses and 7 grandchildren aged from 23months to 8 years. As soon as we arrived, we felt 'at home'. Everyone had a wonderful, relaxing time and the children found it a magical experience, all the more so because they got to build asnowman!! Thank you for writing a review, Jenny. We were happy to have you back and pleased that it lived up to expectations. What a bonus that they could play in the snow at Christmas time! All the best to you and your family. An absolutely stunning place to stay! I booked Penblaith Barn for a long weekend to celebrate my birthday. It's an amazing property in the middle of nowhere, offering the chance to escape from city life and recharge your batteries (that said, there's WiFi and full 4G mobile signal). The Barn is spectacular - rustic and full of character, but kitted out in the same manner as a 5-star hotel. The huge kitchen and separate dining room were perfect for a slap-up birthday meal, and the 3 dishwashers meant nobody was stuck doing the washing-up. The living-space is enormous (2 lounges), and the outdoor hot tub with panoramic views of the countryside was just spectacular. On our final evening there was heavy snowfall, and the owners kindly sent a tractor to help us get the cars out - incredibly helpful. In short, you must stay here! Thank you, Henry. We're really pleased you enjoyed celebrating your birthday at Penblaith. The snow did add a bit of excitement didn't it! All the best. We are an extended family, 18 of us, aged from 4 to 95, and this was our fourth Christmas weekend stay at Penblaith - probably says it all! The house, decor and surroundings are beautiful. We love the views and the outdoor activities, the jacuzzi was magical under this year's super moon. The children enjoy the games room. The chefs have excellent facilities. The big lounges are perfect for family games. The disabled facilities are perfect for granddad. Many thanks to the Pursey family for a wonderful weekend. Thank you for writing a review on your stay. We are really pleased Penblaith meets all of your needs so well and provides the backdrop to your annual family get-together. We look forward to seeing you next year! All the best. Theres a reason that there is no pages missing from their guest book. Every room is en suite, beautifully decorated, clean and comfortable. Everyone is brilliantly accommodated for, the kitchen is fully equipped, there is more than enough glassware/ crockery and even if you should run out, then simply fill one of the THREE dishwashers. Penblaith barn really sets the benchmark for this market and Liz and Amy are so friendly and helpful. The welcome basket is pretty special too. Stayed to celebrate my 30th birthday weekend, it was the most fantastic relaxing weekend, 3 dishwashers made tidying up a dream!! The beautiful setting made for some lovely country walks, and the beautiful house and hot tub made for much relaxing! Thank you for reviewing your stay at Penblaith. We're really pleased you all had a relaxing time. start to finish, amazing facilities and bedrooms and living spaces that are light and airy but retain a traditional feel. We have booked to go back next year! Thank you, Carol. It was great to meet you all and we look forward to seeing you next year! All the best. Our stay was perfect booking all the way through to leaving. Amy and Liz who manage the property were excellent throughout with their level of customer service. The directions to the location are spot on and Penblaith Barn is stunning property big enough for the whole family to stay, eat together and spend time together but also enough room for us all to have our own space as and when required. Anything we needed was on hand from games to cult lay down to details of the closest supermarket or restaurants. Even details of private hire chefs! We hope to come and stay again in the future. Thank you so much for taking the time to write a review and what a lovely review. I'm really pleased you could all get together before the big day next year. We'd be more than happy to have you back again as Mr and Mrs and families! All the best. Thank you, Clinton. Brilliant is what we strive for, thank you for the complement. So pleased you had fun. All the best. Thank you for your review. I'm glad the younger members of the family enjoyed the outside space. I hope you enjoyed your tour of the Granary afterwards. Amazing accommodation in a beautiful setting which catered for our every need. Perfect for a big family get together across the age groups. Liz was welcoming and friendly and we would not hesitate to recommend her gorgeous barn. Our family group ranged from 9 years up to 95 years. Thank you, we are very pleased it satisfied all age groups. All the best. Penblaith Barn is beautiful and full of character in the most glorious setting. My family stayed there to celebrate a special birthday and we couldn't have chosen a better place to be. All the bedrooms are really lovely and there is so much space even with a houseful. My husband uses a wheelchair and all of the ground floor and huge terrace is fully accessible. The owners were extremely helpful with the special arrangements that he needed. We hope to return for another special celebration. Very comfortable surroundings, a real home from home just a bit more luxurious. Hello Lynne. It was very nice to meet you all, it sounded like you had an amazing time! Sorry about the lack of oven glove, I'm not quite sure what happened there as we always provide one plus enough tea towels, hand towels, apron and everything else you might possibly need in the kitchen but I expect you found it all! I hope all of your family had a good journey home to Ireland and elsewhere. We visited Penblaith Barn and met Liz in Oct 2016 and immediately booked for Jun 2017. Lived up to all expectations. Beautifully appointed and all staff that we had contact with were a delight. All family members ranging from a 1 yr-old to 70 years old had a wonderful time. No negative aspects at all. This is the 3rd time we have stayed a Penblaith, on two other occasions we stayed at Trevase. We are a family of 18 aged 76 to 8 living in different parts of the UK. We love the area which is centrally located for us all and offers excellent activities for all age groups. Both barns are very well equipped and very comfortable. We wanted to return next Easter but you are already booked! Thank you! You must really be getting to know the area and the more you do the more you'll love it, I'm sure. Best wishes. Already booked again for next year! All the rooms are of a very high standard and clean and comfortable. The kitchens were very well stocked and a great space for adults and children as well as pets who were on special request. Really enjoyed the views from the hot tub and some lovely runs and cycle rides. A family favourite! We're so pleased you all had such a good time here at the barn and in the area. We look forward to seeing you next year! We needed a large property with all bedrooms having their own en-suite facilities and this fitted the bill to perfection. Everything you need is at the barn - playing field, games, games room, excellent kitchen and hot tub. Yet within easy reach is the lovely town of Monmouth. We also enjoyed excellent walking with the Wye valley and Symonds Yat on the doorstep. The party age ranged from 2 - 75 and everyone had thoroughly good time. Many thanks for taking the time to write your review. We're so glad you had a lovely stay. All the best. A 5* stay at Penblaith Barn with our family. Lots of space for everyone, very well equipped with everything you may need and lovely personal touches on arrival (Easter hunt for the children). Thank you for your lovely review Amy. We're so glad you had a lovely stay. All the best. Absolutely beautiful place, inside and out. Everything is of high standard. 14 of us stayed here and we had the most amazing time. They have thought of everything. Would definitely return here. 10 out of 10. Thank you for your comments, they are greatly appreciated. All the best. A Great weekend for all the family 8 to 80 in a well provisioned barn. The standard of fixtures and fittings is second to none with all the little extras thought of. We spent a fantastic family weekend here. The barn was perfect - they had really thought about everything we would need. There is plenty of space inside and out and the games room was brilliant. The kitchen and dining room had plenty of everything you'd need and the hot tub was a big hit! The beds were comfortable and there was loads of hot water. Amy was also amazingly helpful when I realised we wouldn't be there in time for our grocery delivery. I can't recommend it highly enough. 12 of us stayed for the weekend and 12 of us didn't want to leave. We loved everything about the barn. It was spotlessly clean, cozily warm and loads of hot water. Perfectly set up for a large party,families and groups. Everything is of high quality and the views are to die for. Thank you, Shirley. We are really pleased you all had such a nice time at Penblaith and hope to see you again in the near future. Best wishes. An amazing property very spacious with the most fantastic views. Liz or Any are always on hand either in person or by phone if any problems arise. My children were able to have a lot of freedom in the sprawling grounds. Luxurious bedrooms all really comfortable. A very special Christmas break, we will return. This was our third pre-Christmas long weekend visit. We were a family group of 16 (previous two years we were 18) ranging from grandson aged 3 to great-granddad aged 94. We always thoroughly enjoy our visit, which is perfect for all our needs. The ground floor bedroom works well for great-granddad and the games room, jacuzzi, wonderful kitchen facilities and two lounges are perfect for everything and everyone. Everywhere is so tastefully decorated, including beautiful Christmas decorations. Rooms, bedrooms, are warm and comfortable. This year we loved the beautiful frost covered, sunny vistas each early morning (from the jacuzzi). Liz is always especially helpful with shopping delivery, or in case we've forgotten vital items (turkey foil this year). Our annual visit is a firm favourite in the family calendar and, apparently, the children's best weekend of the year. I hope we'll be back next year too. Many thanks to the Pursey Family! Thanks to Liz for having us back for our 8th visit?!? We still love everything about it and every time we come back it feels like home. We love that you listen if we have any suggestions and enjoyed the upgraded elements from our last stay. The barn has been converted well and is perfectly suited to a large group gathering of family and friends, especially for those looking for a remote rural location. 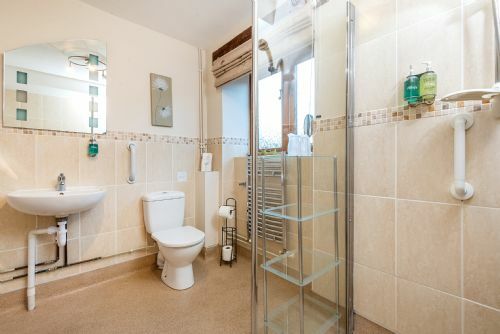 Excellent en suite facilities and a well stocked kitchen. This was our second year at Penblaith Barn for our family holiday. The barn was perfect for all of us, age ranging from 5 months to 88 year olds. Both lounges are extremely comfortable for relaxing in and the barn is large enough to 'find' your own space. The added bonus was the games room and hot tub which were both used daily. The gardens are great for children to have fun in and the goal post on the main lawn was great for energetic children and adults! Good kitchen facilities and great dining area. Thank you for your lovely review Linda. It's always great to see our guests returning and we hope to see you again next year! All the best. Thank you for a lovely weekend. 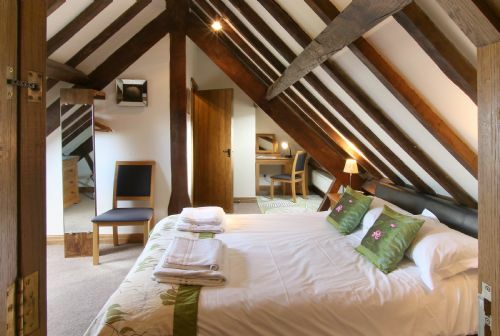 The barn is stunning and every room is very spacious with an on-suite. The dining room and lounges/snug worked well for different games and groups. Well stocked. Amy and Liz (hosts) were friendly throughout. The hot tub has a view across countryside. Thank you Paul and Caroline for your lovely review, we're very glad you enjoyed your stay. All the best. Stunning place to stay at, everyone was so happy with everything! Would defiently recommened! We stayed for my sisters hen weekend, all the facilities were perfect and clean. Couldn't say a bad thing about our stay there! Thank you for making my sister hen weekend perfect with the stunning house!! Would highly recommend to friends and family, and although a bit of a trek for us would defiently come back in the future! Thank you! We're very glad you all enjoyed your sister's Hen Weekend at Penblaith, we hope to see you again in the future. Best wishes. Stunning house with fantastic views in a truly beautiful location. Liz & Amy seemed like very nice people and were very helpful and provided me with all the information I could possibly need. I would love to return in the future with friends, partners and families but I would go as far as saying Penblaith Barn is almost too nice to be fully appreciated by 18 twenty something year old men boozing all weekend on a stag do. A real highlight for us was the large garden space and football goal, this provided us with hours of fun as well as of course sitting in the hot tub in the gusty cold late September weather and looking out at the almost panoramic views of the beautiful green rolling hills on the horizon. I would highly recommend Penblaith Barn to those looking for a long weekend or week away with family & friends. 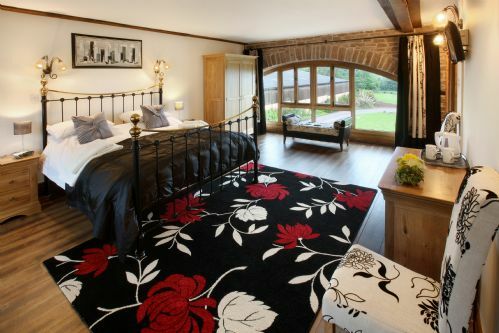 Penblaith Barn is in a rural setting catering for up to 18 guests in 8 seperate bedrooms. The accommodation is five star and our 13 adults and four children thorougly enjoyed our 'family get together' weeks stay. Large and very spacious with enough room to be private if you so wished. The facilities, equipment, and overall standard of accommodation was excellent, and could not be faulted. Good communication from the owners was appreciated, and a personal visit was made on the first afternnon. Although we had no problems, we know that help, if needed, was very close by. Thank you, Michael. We are pleased you all enjoyed yourselves at Penblaith. Best wishes. A beautiful conversion with all the comforts of a home from home. We stayed for a hen do and the location worked perfectly for activities in the Forest of Dean and lovely base to come back to. The hot tub was a huge hit! We had great weather so spent most time outside, but there were plenty of entertainment options we could have taken advantage of if needed. Something for all ages! Fully equipped lovely accommodation, perfect situation for large family get together, 3rd visit. Sixteen of us had a reunion at Penblaith . We had been before and chose to go back as it is one of the best places we have stayed. We go to a different place each year. Liz was very helpfull when I realised I had a person without a bedroom. She came over straight away and made up another bed in our room which we were all happy with. Thank you. It was lovely you chose to return. We are really pleased you all had a comfortable stay and hopefully we may see you again. Fourteen of us had an amazing long weekend to celebrate three couples Ruby weddings. The location is so beautiful and peaceful and the house is awesome. So well equipped more than enough of everything and all beautiful quality. 3 dishwashers!! Everyone loved their rooms and the quality of the linen etc. Nice touches like coffee and tea in rooms and toiletries. Also the little things like dishwasher tabs, salt and pepper, toilet rolls! Great selection of games and loved the hot tub! Couldn't do anything about the weather and would have been great to spend more time outside but had a fabulous time. Thank you for reviewing your stay. We are glad you enjoyed your time in the barn despite the weather and appreciated the finishing touches too. Hopefully, if you come again you will be able to appreciate the views over a BBQ! Beautiful barn, beautiful location. Could not have asked for more! Everything you could need to cater for 18 was provided. Thank you for taking the time to write a review. We're glad you had a lovely stay. All the best and hope to see you again in the future. We have just returned from the most amazing weekend in Penblaith Barn. We were a party of 18, ranging in age from 4 - 76 and a great time was had by all. 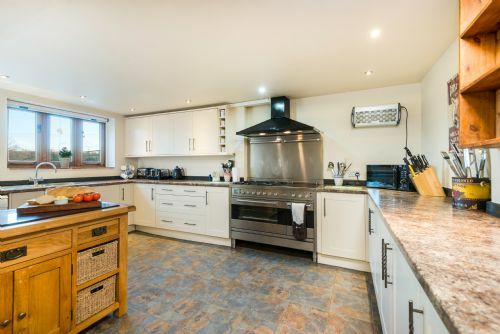 The location is idyllic with far reaching countryside views, the property is spacious, characterful, immaculate and has everything you could possibly need in terms of kitchen equipment, crockery, etc. We all loved the hot tub and games room, and because the weather was beautiful all weekend long we spent most of it outside enjoying the facilities. The only downside was that we had to leave! I would highly recommend this property, and hope we get to return some time soon. What a wonderful review Glynis, we're so glad you had a lovely weekend and that the weather was kind. Best wishes. This was our 2nd stay at Penblaith with our children and grandchildren. The accommodation is perfect for large numbers - We are 9 adults and 7 children. We will hope to return next year, there is so much to do in the area and the Barn has excellent facilities. We have also stayed at Trevase on two previous occasions. Both properties are excellent. Thank you for another lovely review Katherine, we always look forward to guests returning to the cottages, hopefully we will see you again next year! All the best. Great barn for our 50th celebrations. Comfy lounge to relax in. Beautiful grounds and hot tub. Thank you for your review Anne, we're pleased that it made for a lovely celebration. All the best. This is our 7th visit to Penblaith, but our first for a whole week. It was awesome. The house never gets boring, the views and sunrise are always amazing. The neighbours are friendly, even the goats :) and Liz is always on the ball should we need anything! Always a pleasure to have you and your group stay Emma, we look forward to seeing you again in November! A lovely property in a perfect location. We are a group of friends that go away together once a year and this was the best yet. A holiday property that is as good as the description and photographs. We will definitely come back. Thank you for your lovely review, we're glad you enjoyed your time away with your friends and look forward to seeing you again in the future. All the best. Penblaith Barn was a fabulous venue for my daughter's hen weekend. We all had a wonderful time at a great location with great facilities and lots of information. We're very glad that you enjoyed your Hen Weekend at Penblaith and found everything that you needed. All the best for your daughters wedding and hope to see you again in the future. We were a group of 18 ladies staying at Penblaith for a hen do. The barn is beautifully converted with plenty of space and attention to detail. 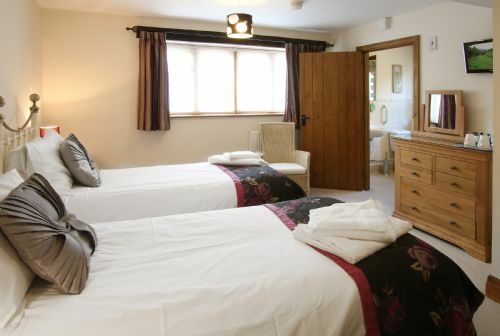 The rooms (all double/twin with en suite bathrooms) were clean and nicely presented with high quality linen and towels. The communal areas were large and we especially appreciated the big dining table which easily seated all 18 of us. The kitchen was well equipped and we were supplied with a nice starter pack. The hot tub and games room had plenty of use and the surrounding gardens were spacious and well presented. Liz (the owner) came to greet us and was very accommodating. Thanks for a wonderful stay! The barn was beautiful! Only problem for us was carpet in the disabled room, would have been easier with a hard floor to move the mobile hoist also a metal bed to get hoist underneath the bed and therefore not needing to use bed raisers! Finally a moveable shower door to give more room for mobile hoist in the bathroom! Other than this the barn is amazing! Many thanks for your useful review Chrissie, we apologise for any inconvenience and will use your suggestions in order to improve access for the less able. We're glad that you found the rest of the barn and your time away enjoyable. All the best. A great venue that was well looked after, equipped to the hilt and perfect for what we were looking for. Liz was easy to deal with to make the booking. The games room and hot tub were a hit and the kitchen and magnificent dinner table helped us host some great evening celebrations. We would highly recommend Penblaith Barn! Thank you for taking the time to write a review Duncan, we're glad you had a lovely weekend and that the Barn was everything you needed. Hope to see you again in the future. Penblaith Barn was perfect for our family weekend away celebrating a 60th Birthday. Brilliant for all ages. We especially loved the Hot tub and Games room. We hope to return again. Thank you for taking the time to write a review, we're very glad you had a lovely weekend and hope to see you again. All the best. We had very high expectations from viewing the photos and the information contained on the website. Our expectations were more than exceeded, the attention to detail, the cleanliness and the facilities were fantastic. There was everything that we could have needed which made for a very relaxing stay. A great find and a real credit to the owners. We look forward to staying again. I can also recommend The Lough Pool for Sunday Lunch, we had a lovely meal in a beautiful setting. Thank you for your lovely review James, we're very pleased that you had a wonderful stay. Hopefully we will see you again in the future. All the best. Excellent place to stay, very well equipped from comfort and catering; beautiful views, when it wasn't howling a gale and throwing it down, but hey what can you expect fro December! Really nice people to deal with, welcome pack was excellen; and the help with taking in our shopping before we got there was brilliant. I would now like to spend time there in the summer and really apprieciate the surroundings. We're glad the weather didn't affect your stay Martin, it really is a lovely place to stay in the Summer as well as Christmas so we hope to see you again at a warmer time of year! All the best. This was our second stay at Penblaith Barn and once again we had a brilliant time. Its perfect for big families, very spacious. We can't wait to come back. Mum's surprise 70th Birthday weekend!! We stayed at Penblaith Barn from Friday 11th until Monday 14th December 2015 for a 70th Birthday surprise. This barn is absolutely amazing and a great time was had by all. The re were 18....all family and grandchildren ranging from 13 to 25. We will definitely be returning again, thank you. Thank you for your lovely review Tania, we're so glad we could cater for your surprise party. We look forward to seeing you again soon, maybe a surprise 71st? All the best. Superb house in a stunning location with excellent facilities, a truly magical place. Thank you for your lovely review. We feel Penblaith caters for all ages and we're glad you can agree. Hopefully we will see you again in the near future. All the best. We are an extended family group of 18 people, aged from 2 to 93 years, and this was our second stay at Penblaith Barn, for our annual pre-Christmas gathering. We'd loved Penblaith so much last year that we re-booked for this year, and thoroughly enjoyed ourselves (again). Though the weather wasn't great, it didn't matter at all because we had fun in the games room and in the outdoor hot-tub. We were snug and warm throughout our visit, and loved the Christmas decorations. Everything one could ask for was there: extremely comfortable beds, spacious bedrooms, beautiful décor, excellent cooking facilities, two lounges big enough for family activities and lovely views all around. The Pursey family are very helpful and prompt if questions arise, and the Monday morning housekeeping team were lovely too! We say 'thanks a million' to Liz and Amy for a wonderful and memorable 3-night stay. Many thanks for your review Maggie, we're so glad you enjoyed your second stay at Penblaith and we hope to see you again next week! All the best. This is my 6th time staying at Penblaith barn, we come every 6 months for a craft retreat weekend because it is PERFECT for our needs. Liz is always very helpful and accommodating, it's like coming home and seeing an old friend every time we stay. The house is always in excellent condition and it's so easy to make yourself at home here, I wouldn't keep coming back if this wasn't the case. Thank you for your lovely review Emma, it's always a pleasure to have you and the rest of the crafting team to stay. We look forward to seeing you again in May! We have an annual get away every November with a group of adults ranging from 12 - 18 couples aged between 30-65. We like our home comforts, so things like on-suite bathrooms are a must have, we love either a hot tub or heated pool or both. When we booked Penblaith Barn 8 on-suite bathrooms and a hot tub we hoped we'd have a good time. I can confirm we had a brilliant time the house is fantastic, spacious, warm and comfy, plenty of just about everything needed. We hired caters listed on Penblaith Catering list called Catherine and Paul Smith and OMG they did us proud! They could not have been more accommodating if they tried, they delivered 110% perfection on a plate. The only down side we said was there was too much food that was too good to leave... we had pre-dinner nibbles, then a 4 course meal and every single mouthful was beautifully presented and very very tasty. Thank you for your lovely review Helen, we're sorry to hear about the light bulbs and we're very glad that the caterers produced such a lovely meal for you. Hopefully we'll see you again soon. All the best. 16 family and friends had an excellent week, the facilities at the barn were perfect for all ages, the hot tub was the star of the show. Everyone was happy with their bedrooms, all unique, some quirky, some more spacious than others, but still more than enough room in all of them.Plenty of comfortable living space and the kitchens have all the equipment necessary for catering for 16. Thank you for completing a review, we are so please you enjoyed Penblaith and all its character including the ever popular hot tub, hopefully you had some clear weather to make the most of it. All the best. A wonderful time had by all! My family and myself had a fantastic mid week holiday to celebrate my 70th birthday. The age range was 4 years to me, and there was something for everyone. Everything in the house was top class - it just couldn't have been better. We absolutely loved it, and were very sad when it was over. We will always remember our time at Penblaith Barn. Thank you. We're so glad you enjoyed you're birthday celebration at Penblaith Jill, it really is a lovely place for the whole family. Hopefully we will see you again in the near future. All the best. Beautiful, impressive, stylish and spacious barn. Very comfortable and extremely well equipped with lots of thoughtful extras. Great to have every bedroom en suite. Very comfy beds with high quality bed linen. Hair driers, TV and tea and coffee making facilities in every bedroom. Lovely big dining table we could all sit round and very good kitchen with three dishwashers. Good to have two lounges, both with lovely comfy sofas. Really enjoyed the games room, the hot tub and all the space outside. Great views and peaceful location. Very pleasant , friendly,helpful and efficient owners. Would love to return. Thank you for your lovely review Sue, we're so please you enjoyed your stay and hope to see you again in the not too distant future. This was our eighth stay there and we shall be there again next year. We find that all the facilities are excellent and we are always very warm and comfortable. We keep finding lovely places to visit is this part of Herefordshire. There are so many lovely places to visit in Herefordshire that I'm sure we will see you many more times Hilary, and we very much look forward to it. Thank you for your review. The perfect location for a fun-filled hen weekend! We stayed at Penblaith Barn recently for my hen weekend and had an amazing time. There were 15 of us in total and there was more than enough space - the bedrooms are all a good size and there is definitely more than sufficient living space downstairs! The Barn was very clean and has all the facilities you could ask for - the hot tub is great! The outside area would be wonderful in the summer and the views from the property are stunning. Everyone agreed that it was by far the best place they had stayed! We're so pleased you enjoyed your hen weekend at Penblaith Barn and that everyone enjoyed the facilities- the hot tub is always a winner, many an hour can be spent in there taking in the views and chatting away! Glad you enjoyed the Moon at Garway, it is one of our favourites. We wish you a wonderful wedding day and blissful honeymoon. All the very best. A fabulously spacious barn for large groups and families. The views are beautiful and It is close to a town for provisions. There are almost too many things to do and visit in the area and some excellent pubs and restaurants too. We had great weather but the added bonus of a games room for wet days was a good backup plan to have available. Thank you, Kate. We are really pleased you made the most of your week exploring the area and experiencing some of our 'gems'. We hope you will come back again to enjoy some more of them in the near future. There was a group of 17 family and friends that stayed at the barn, everyone was impressed with their rooms, the set up, the décor etc. The house was perfect for all our needs and had so much space people could go off if they wanted some peace and quite. The hot tub is a perfect extra and much time was spent in here. We were very lucky to have glorious weather for our entire stay so we made the most of the outside seating and of course the most amazing views. This same group of family and friends also stayed at Trevase Granary around 3 years ago and everyone said they would not look any further than these 2 properties if they were looking to hire a large house for an occasion. Im sure we will all be back at some point, very well done to the owners, they thought of everything! Thank you so much for writing a review for your stay, Cheryl. We are so pleased you all had a great time and a bonus that you had good weather so could make the most of the views and outdoor facilities. We hope to see you all again in the near future. All the best. This is our 2nd year at Penblaith. It is a very comfortable venue and the owners are very helpful. There is so much to see in the area and we plan to return again. Thank you for taking the time to complete a review. We are pleased you all had a comfortable and pleasant stay. Yes, we are very lucky to be situated in such an interesting area with lots to discover and beautiful places in which to walk, I'm not sure how many years it will take to get around it all!! All the best to you and your group. The barn is superb, everyone commented on how amazing it is and we felt like we were in total luxury for the whole stay. Amy and Liz are absolutely lovely and really helped make our stay fantastic (and thanks for our card!). The website is excellent and filled with helpful info for making your stay extra special. Nobody wanted to leave and we are already trying to think of an excuse to come back! Many congratulations again! We are so pleased your weekend went as planned and feel privileged to provide the venue for your special day. It would be lovely to have you back, an anniversary would be the perfect excuse! All the very best. Wow, what can you say but stunning beautiful amazing, everything you dreamed off, want to live here. We're really pleased you enjoyed your time at Penblaith. Thank you for your review and for the caterer recommendation too! We hope you will be able to return in the near future to explore more of the area. All the best. A perfect holiday for a big family. Penblaith Barn exceeded our expectations. 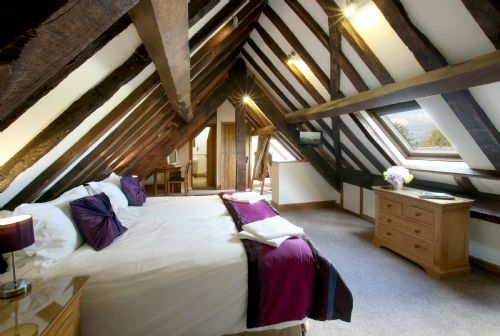 Stunning barn conversion with comfortable rooms for all. Everything about this barn is spot on. We would definitely be returning here. Thank you for your review, Tanya. We're really pleased you all had a lovely holiday with some great weather too! Hopefully it will be kind when you return in December! We look forward to welcoming you back then. Fantastic property in a great location. Every need catered for, from the less abled to youngsters, would highly recommend for a big family gathering. Thank you for completing a review, Denise. We are very pleased you loved the property and enjoyed the surroundings. We hope to see you again in the near future so you can explore some more! All the best. We have returned ever year since the Barn first opened and every year we can't find fault. its an exceptional property in exceptional countryside. Spacious with lovely furniture and works of art add interest and add a homely feeling. Just got back from a fab holiday and have already booked for next year. There is plenty to do and see locally and many places to eat. Thank you for your complimentary and kind words. It is always a pleasure to have you all back, hopefully it feels like home away from home! Great that you have seen so much of the area and continue to find some of Herefordshire's hidden gems! See you next year! A problem arose with the hot water but Liz fixed this immediately. As the top floor bedrooms were very hot the availability of some fans would have been appreciated. However, everything else enables guests to have a wonderful time at this barn. Thank you for your review. We will look into getting some fans as on the rare occasion that there is no breeze on a hot and humid night we can see that a fan would be a welcome addition. We're really pleased you enjoyed the property so much. All the best. We had an excellent weekend and spent a lot of time working out when we could return. I didn't hear any complaints about anything from any of us. It was a superb weekend in every way and cannot speak highly enough if it. Thank you for reviewing your stay at Penblaith. We're really pleased you enjoyed your birthday weekend. We look forward to hearing from you again when you have agreed on the next date! All the best to you and your family. We stayed at Penblaith Barn in June for my sisters hen party, well what a fantastic weekend! Stunning location, beautiful accommodation and so well equipped with everything we could possible need for the weekend and more! The information on the Trevase cottages website regarding local activities and services was brilliant and very helpful. Will definitely be visiting again! Thank you. Thank you so much for your review and for sharing some great photographs on our facebook page too! We are really pleased you enjoyed your time at Penblaith and that it all went well. I'm really pleased you found ideas and everything you needed to know on our website as it is something we take care to recommend only good local businesses. We'd love to have you back again! All the best for the wedding. Penblaith met the very high standards we previously enjoyed at Trevase. We had a brilliant family holiday. Everyone (12 of us) said that they would like to go again. The accommodation was excellent and the location allowed us to explore the area - we had some great trips out. Thank you for taking the time to write a review. We are really pleased you had a good week at Penblaith and made the most of some of what the area has to offer. We are very lucky to have such a lot on our doorstep. We hope to see you again in the near future. All the very best. Thank you for taking time to comment on your stay; so pleased you had a good time. A cheaper option would have been a prebooked minibus around the area, there are various options on our links page. If there is a next time perhaps you could try Trevase Granary if you like a lounge and dining area all in one space. We hope you all have a fantastic time at the upcoming wedding! All the best. The house was beautiful and an excellent lay out to stay with large group of ladies. Having 3 seating areas was good allowing people to either sit together or in smaller groups. The bedrooms were beautifully laid out. The hot tub was clean and well maintained. Thank you so much. We're really pleased you had an enjoyable gathering. We look forward to seeing you again this time next year! Best wishes. The kitchen was very well stocked- it had all we needed including a food mixer which we used. It was lovely to have enough toilet roll, tea and coffee etc- only the sugar ran out! Thank you for your comments. We regularly get compliments about the kitchen! As we are a five star self-catering accommodation we like to give our guests some provisions to get started with so it is good to hear that we are providing a generous amount to last you so long! All the best. It was a family holiday.......grandparents, parents, grandchildren. The accommodation was excellent and the games room, grass playing field and hot tub were very popular. Also, the surrounding area was ideal for different things to do, appealing to all ages. Thank you so much for your review. We are really pleased you all had a good time and super that you had some lovely weather too. We hope to see you again in the near future. All the best. Stayed here for a weekend with all my friends for my 30th birthday at the end of January . Have to say this was one of the best self catering cottages Iv ever stayed in . Could not fault anything and so well equipped, clean and was total luxury.We all had an amazing time and would like to thank liz for having us and letting us stay in her wonderful barn .would definitely stay here again. Thank you for your review. We are really pleased you had a fantastic 30th birthday here. 14 of us stayed in Penblaith Barn for my husband's 40th birthday. The accommodation was beautiful and everyone was very pleased with the property. We had everything we could have needed including 3 dishwashers, several fridges and even a wine cooler. The views from the master bedroom were beautiful and the surrounding countryside was stunning. All in all this place was great and we had a thoroughly good weekend. The only small comment i would make is that some of the rooms had baths rather than showers. There were shower heads attached to the baths, but if people in these rooms wanted a shower they had to use one in another room. Other than that, this place was a great find. Thank you for your feedback. We are so glad you enjoyed your time at Penblaith. A good tip about the taxis- always best to book in advance and we have just come across an excellent private minibus firm which is now in our links section http://www.trevasecottages.co.uk/links.cfm?Category=Travel. In April we will be replacing one of the baths in the second floor rooms with a shower but yes, everyone has their own preferences so it is tricky! On the other hand with three of the en-suites having baths and showers they are a bit spoiled for choice! All the very best. One of the best places we've stayed in for our 18th annual Christmas family gathering of 18 people, this year's ages being between 1 year and 92 years old. The house is gorgeous, with every possible useful amenity, and lovely little gifts left for us, everywhere warm upon arrival, with lots of hot water. The children loved playing outside in the beautiful grounds. We all enjoyed our pre-sunrise and moonlit dips outdoors in the jacuzzi whilst the frost sparkled on the gardens! Liz went the extra mile with help as regards shopping and deliveries, especially helpful following our accident en-route. We're looking forward to our next visit. Thank you very much for your complimentary comments. We are really pleased that you all arrived safely and made the most of your weekend. I hope you had some clear night skies to look up to from the hot tub as we can see the stars brilliantly from around here. We will look forward to seeing you again. All the best. After 29 years of going away to a country house in UK with friends we have to say this was THE BEST house ever. Even better than Trevase Granery, and that one is pretty amazing too, being Liz's other property which we stayed in 3 years ago and which is why we came back to the area. Everything about Penblaith house is super from the size of the rooms, all ensuite & with loads of hot water; the way the house is presented & decorated with homely touches; the views over rolling countryside & horses; well equipped kitchen and fab hot tub. What makes it even more special is Liz's attention and care. She was there to welcome us and give us a super basket of goodies and when one of the dishwashers stopped working on 30th Dec she had a new one installed by that afternoon - that's real service ! We loved it all and just wish Liz would have houses all over the country as we do like to move around. But we will be back one day as it was so good and we also love the area with so many nice walks and interesting places to visit. We are really pleased that Penblaith Barn suited you all so well. We look forward to seeing you all again in the near future! The whole extended family of 17 had a wonderful, memorable Christmas where the five 5's and under all enjoyed the freedom of space on the ground floor. Yes, lots of space to play indoors and out! We are really pleased you all had a good Christmas. All the best. This was our third visit to Penblaith. A reunion between two (growing) families. The youngest this time being three months old. Beautiful house and setting. Perfect for our needs. Our only fear is that we are going to outgrow it! Thank you for your review. We are very pleased you keep choosing to come back. Hopefully, we will see you again in the near future. This was my third time back to Penblaith barn in 2 years so I would think that speaks volumes itself! I have taken 2 separate crafting groups there and both have loved it. It's spacious, even for 16 well loaded crafters and stash. It's comfortable and definitely home from home. Liz couldn't be more helpful, and we are already discussing our dates for next year. Thanks for another awesome girly weekend away, see you soon! Thank you, Emma, for taking the time to write a review. We are always pleased to see you back again and glad we can satisfy all your needs! All the best. Loved this place so much! Everything was there. For us! Beautiful barn conversion in fab location. So lovely we will be forced to return!!! Definitely recommend! Thank you for your hugely positive review, we are so pleased you loved your time at Penblaith! We look forward to welcoming you back in the near future. Thoroughly enjoyed our stay. Property was fully equipped with every home comfort. Perfect facilities & location for a family party. We didn't want to leave! We are so pleased you had a lovely time and everyone's needs were well catered for. We are so lucky to be in the middle of the country so it never seems too far for people to come for a short break. We hope to welcome you back in the near future. All the best.